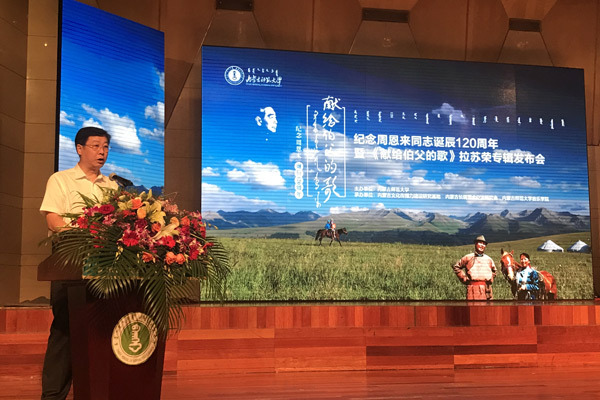 A new album titled “Song to My Uncle” was released by the singer La Su Rong at Inner Mongolia Normal University (IMNU) in Hohhot, Inner Mongolia autonomous region, on Sept 12. La Su Rong, who is the husband of the niece of former premier Zhou Enlai, pays tribute to the late political heavyweight on his new album, which has been released to mark the 120th anniversary of Zhou’s birth. 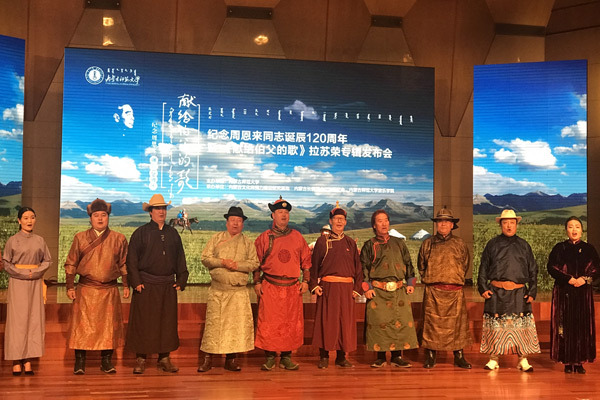 Many of the album’s tracks also honor the beauty of the autonomous region, an area La Su Rong and his wife have devoted their lives to. Some of the tracks have been performed for China’s most important figures over the years, including Chairman Mao and Deng Xiaoping. La Su Rong has been a member of Ulan Muqir Troupe since he was 13, and is now one of the three major ethnic Mongolian tenors in China. He has had a career spanning six decades, with many of his songs famous throughout China.